Nathan loves to build things. Train tracks, legos, puzzles… anything that requires assembly, he loves them! He’s especially adept at putting his train tracks together, complete with bridges and tunnels. Sometimes his creations can get pretty big! Here’s a picture of a smaller one he built by himself. 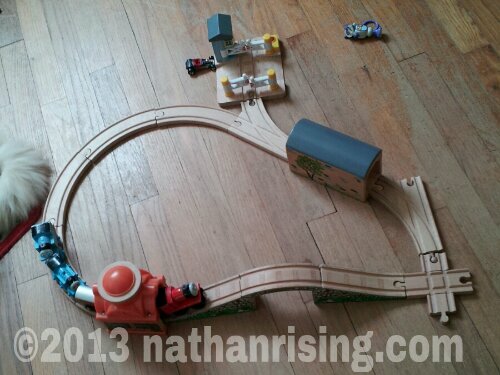 I think it’s awesome how he can even close the circuit so the tracks are in a (sorta) circle. His trains can’t exactly make that 90 degree turn you see there, but he’ll figure that out pretty soon I bet.